Marble Cake,the name itself is different and so as the taste.These days I'm having it more often whenever we stop at Starbucks for coffee and wanted to try this at home.I got the basic pound cake recipe from a book and used the recipe to make a Marble cake.Usually I use cake mix to make a cake at home but this time I wanted to make it from Scratch and made it. 1.Preheat the oven at 350 F,Combine all purpose flour, baking powder,baking soda,salt in a large bowl. 2.Beat the butter,sugar,almond extract,vanilla extract in a bowl and beat with a hand mixer on medium speed until creamy.Add the egg one at a time and beat until just blended after each addition. 3.With the mixer at low speed,gradually beat in the dry ingredients alternating with the milk,batter is ready now. 4.Take 4-5 spoons of prepared cake batter into bowl and add in the unsweetend Coco Powder,mix well and add 2 spoons of milk to make it smooth or else the mixture will become hard. 5.Spoon the plain cake batter into a pan which is greased with butter and coat it with little all-purpose flour and dust out the excess. 6.Using the coco mixed cake batter make 4 strips on the cake as shown in the pic below. 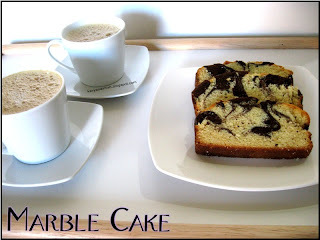 7.Now take a knife/some sharp edge to make swrills this makes a beautiful Marble cake after baking and slicing the cake. 8.Put this cake pan in oven and bake it for 50-60 mins or check if the cake is ready by piercing a tooth pick in the middle of the cake,when it comes out clean then the cake is ready. Remove the cake from the pan and let it cool down completely n then cut it into 1/2 inch slices or u can cut them to ur desired thickness. Serve it with a cup of coffee or Tea. Yesterday was our 22nd Monthly Wedding Day,baked this yummy cake and we cut it in the evening after my hubby is back from work. I made this and arranged to surprise him,I heard the door bell and saw my hubby bought half a dozen of balloons to surprise me.Finally we had a small celebration and then went to Macroni Grill,enjoyed our Fav Eggplant Parmesan.He liked the cake very much,smelled the cake and told that he cant wait to taste the cake,tasted it and said YummmmmmY. 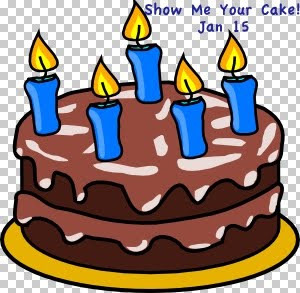 Sharing this cake recipe with Dilse for Show Me Your Cake event in her blog. Waiting to see more delicious cakes in this holiday season. Seems fabulous cake!! Thanks for this great recipe. Great idea for perfect marbling..Gonna try it your way.The swirls look great! !